Christy Whitman was 30 pounds overweight, had broken up with another “bad” guy, was 60k in debt, did not have a job, and was living in a room in a strange woman’s house. Shortly after that her sister committed suicide. On overwhelm, Christy committed to her own growth and making her life work, healing all the pain inside of herself so she did not go the same route. So she started to apply the universal laws and overnight, started seeing her life change. Shortly after those initial changes, Christy’s first book came to fruition. Today, Christy is a Transformational Leader, Celebrity Coach and the New York Times bestselling author of The Art of Having It All. She has appeared on The Today Show and The Morning Show and her work has been featured in People Magazine, Seventeen, Woman’s Day, Hollywood Life, and Teen Vogue, among others. Christy is the CEO and founder of the Quantum Success Learning Academy & Quantum Success Coaching Academy, a 12-month Law of Attraction coaching certification program. She has helped thousands of people worldwide to achieve their goals through her empowerment seminars, speeches, and coaching sessions and products. Christy’s life-changing message reaches over 200,000 people a month and her work has been promoted by and featured with esteemed authors and luminaries such as Marianne Williamson, Dr. Wayne Dyer, Marci Shimoff, Brian Tracy, Neale Donald Walsch, Abraham-Hicks, and Louise Hay. 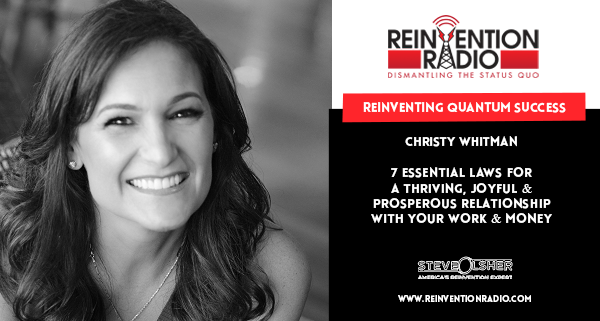 Tune in to hear Christy chat with Steve, Mary, and Richard about the seven essential laws for a thriving, joyful and prosperous relationship with your work and money. Reinventing Modern Elders – In this episode, tune in to hear Chip Conley chat with Steve, Mary, and Richard about modern elders and liberating the term “elder” from the stigma of “elderly”.